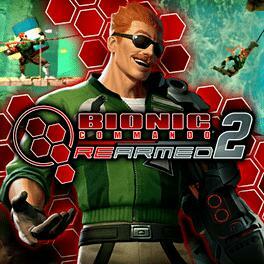 Capcom presents the next evolution in retro side-scrolling action with Bionic Commando Rearmed 2. Equipped with his famous bionic arm, Nathan 'Radd' Spencer swings back into action in order to stop General Sabio from launching a deadly missile strike. Swing, leap, and shoot your way through lush new environments as you encounter countless enemies and huge bosses throughout the island of Papagaya. Bionic Commando Rearmed 2 takes platforming action back to its 2D roots, but with a slew of modern day upgrades like vibrant, cutting edge visuals and a brand new retro-remixed soundtrack. New features such as the bio-vision scanner, customizable arm components, and character upgrades will take 'Radd' Spencer's abilities to the next level! Now available on Xbox Live® Arcade and Playstation® Network.